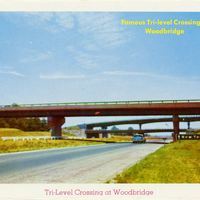 A postcard depicting the tri-level crossing of the New Jersey Turnpike (NJTP) with the Garden State Parkway (GSP) in Woodbridge, New Jersey. The turnpike opened in 1951 and was intended to be the world's model highway. It is still the most heavily traveled tollway in the United States. Originally called Route 4 Parkway, the GSP opened in 1947. "Welcome!." Garden State Parkway: A Historic Journey. http://www.gsphistory.com/home.htm. 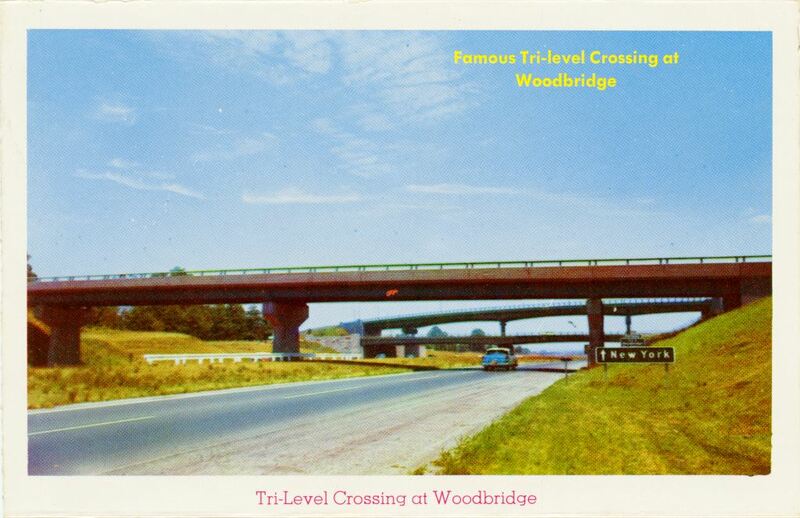 “Famous Tri-Level Crossing at Woodbridge Postcard.” RICHES of Central Florida accessed April 24, 2019, https://richesmi.cah.ucf.edu/omeka/items/show/6725.